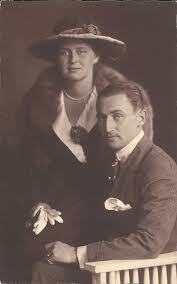 The marriage of Prince Stephan of Schaumburg-Lippe(1891-1965) and Duchess Ingeborg of Oldenburg (1901-1996) was a good dynastic match. Prince Stephan was the 5th child of the late Georg, Prince of Schaumburg-Lippe and Princess Marie of Saxe-Altenburg. Ingeborg's father, Friedrich August, was the last reigning Grand Duke of Oldenburg. Her mother was Duchess Elisabeth of Mecklenburg-Schwerin. The couple were married at Rastede on June 4, 1921. The groom was 29 and the bride, a month short of her 20th birthday. The couple had two children. Prince Georg-Moritz (1924-1970) and Marie-Alix (1923.) 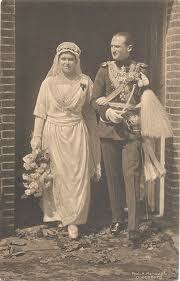 In 1947, Princess Marie Alix married Peter, Duke of Schleswig-Holstein. 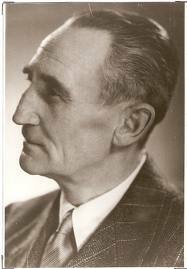 Prince Stephan was active in the Nazi Party. On June 3, 1940, he arrived in Montivideo, Uraguay, on board the Brazilian passenger liner Argentina. He was on his way to Buenos Aires to be the counselor at the German embassy there. On board the ship, he asked the elevator boy if he could speak German, reported the New York Times. The young man replied no, to which Prince Stephan replied: "Well, you letter learn it. You are going to need it." A year later, Germany's Ambassador to Argentina, Edmund von Thermann, along with Prince Stephan and other counselor at the German embassy, were the subjects of legal proceedings in Argentina. The process was begin by the president of an Argentine congressional committee "investigating anti-Argentina activities." The Argentine constitution placed diplomats under the jurisdiction of the Supreme Court in "exceptional cases." This meant that the three men were not subject to diplomatic immunity. This was based on comments made by them, and the German Reichs press's attempt to infiltrate Argentine sovereignty. Von Thermann was eventually ordered out of the country. According to Jonathan Petropoulos's Royals and the Reich, Stephan zu Schaumburg-Lippe joined the Nazi party on 1 October 1930 and was party member #309344. Very interesting. I've not studied much about these lines and so wonder what became of the couple in their later years. Can you recommend some good further reading on the subject? Nothing in English apart from David McIntosh's photo book on the Oldenburgs. Stephan was mentioned in Royals and the Reich but after the war, the family lived under the radar due to their support of National Socialism. Thank you, Marlene. I think I'll look for Royals and the Reich. Sounds interesting. Nicholas Romanoff loses "rich property"
Philippe and Mathilde in D.C. Does Charlene have cold feet? So where was Lord Frederick Windsor? 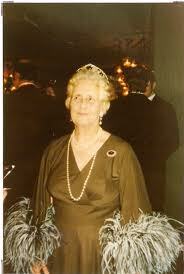 The Duke of Kent marries "in elaborate rite"
Not too hot for Your Majesty?